We've already made a strong argument NOT to drink pasteurized milk if at all possible. And I think Dr. Cordain (author of The Paleo Diet ) makes a good argument to NOT include ANY dairy in your diet. You'll be fine without it as long as you eat your vegetables as part of a healthy paleo-style diet. But let's play devil's advocate and say you want to drink milk. I know I do on occasion, may the paleo gods smite me for it. There is nothing in this world like a breve latte (it's a bowlful!) from Santa Cruz's finest: Verve. Seriously chill place. And a life devoid of cheese? Not. Worth. Living. So without a bona-fide dairy allergy making it impossible to partake, I do perchance partake. Is that okay? Can You Be Healthy WITH Milk? Although the Paleo Diet (as Dr. Cordain envisioned) doesn't advocate milk or any other dairy, many paleo dieters categorize themselves as paleo + dairy or Lacto Paleo. Mark's Daily Apple's Primal Diet doesn't promote, but isn't against including dairy. The Weston A. Price Foundation definitely advocates raw dairy. There is a kaleidoscope of possibilities for inclusion or exclusion of dairy in your diet, such as only raw, grass-fed, organic or from only certain animals (cow, goat, sheet, etc. ), or certain forms like butter and/or cream but not milk. Take your pick. The best answer to this question comes from YOU. My suggestion: give up ALL dairy for at least two weeks. Then, introduce it back in slowly, one type at a time and see what happens. If you get all phlegmy and symptomatic, then guess what? You are sensitive to dairy! So maybe it doesn't make you as healthy as you can be. You might find that you digest certain forms of dairy better than others. Congratulations, now you have choices! You can't say it makes YOU healthy or not unless YOU give it the old N=1 self experimentation. Believe me, it is eye-opening! If you read our last installment, What's Wrong With Milk? (Part A) and (Part B), you may question whether or not anyone really needs milk in their diet. Well, here is one reason: putting on the poundage. 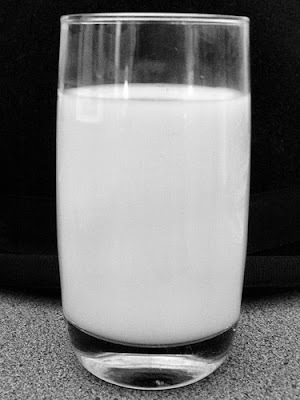 Weightlifters know the benefits of milk for mass gaining and many practice GOMAD: gallon of milk a day. According to them, it is ideal for putting on weight. That is something to keep in mind if you are an adult who drinks milk daily and might be watching your weight. If you are trying to lose weight, milk is definitely NOT what you want to be drinking. But what if you just want to drink milk and aren't on a weight loss plan? Is milk healthy? The answer is: it depends on whether or not it's pasteurized (heated to kill bacteria) and homogenized (squeezed through a fine strainer to break up fat and eliminate separation). Hint the more processing, the less nutrition. That is true of everything. It also matters whether or not the milk comes from grass-fed or grain-fed cows, just like beef. Grain-fed cows are NOT healthy, so guess how healthy their milk is? It isn't all that surprising that if we feed cows and other milk animals what they evolved to eat, we get a superior product. And that product is a real food on its OWN. It doesn't need any enriching or processing to make it better than it already is. Conclusion: If you choose to partake, raw milk is the way to go! What are the Potential Benefits of Raw Milk? Fat is listed by both sources, so don't be afraid of full-fat dairy. Fat is NOT what makes you fat. That fat in milk helps you absorb the fat soluble vitamins in milk. And milk has the beneficial fat CLA (conjugated linoleic acid), which fights cancer and has been linked to weight loss. Since grass-fed cattle have 3-5 times as much CLA as feedlot cows, here is just one more reason quality matters. For more on CLA and grass-fed animals (as well as where to buy grass-fed meat and dairy and pastured eggs) check out Eat Wild. Can pasteurized, even organic pasteurized milk compare with the nutritional bounty of raw milk? Check out Organic Pastures's Why Raw chart comparing Conventional, USDA Certified Organic, and Raw USA Certified. Still not convinced? Check back for our next installment on the safety of raw milk. It'll be eye-opening! In the meantime: At least do your body a favor and buy organic, full-fat, grass-fed dairy. And open your mind to at least TRY raw dairy. What does it taste like? Milk. Real milk. The milkiest milk you've ever tasted. For me, I'll exchange watery, conventional milk for rich, creme anglaise raw milk any day! Bottom line: If you are going to drink milk, choose raw, organic, full-fat grass-fed, dairy, otherwise known as Real Milk. Keep reading the series for more on raw milk and questions about its safety! With all processing, nutrition is lost, BUT the product now has a longer shelf life and is more uniform even though its constituent parts may vary. The same goes for milk. Pasteurization involves rapidly heating milk to kill off ALL of its bacteria, beneficial probiotics and any detrimental bacteria alike. Pasteurization heats milk to 161 degrees Fahrenheit for 15-20 seconds while "ultra" pasteurization heats to 275 degrees Fahrenheit for a fraction of a second, resulting in an even longer shelf life. This is a great quality control mechanism for producers of conventional milk. They can make their fortunes from confined cows eating pesticide-sprayed and genetically-modified grains they were not designed to eat (they evolved to eat grass) and that make them sick. To keep their cows alive, producers (a more fitting term than farmers) pump the sick cows full of antibiotics and add growth hormones to increase their milk production. And where do you think all those chemicals go? 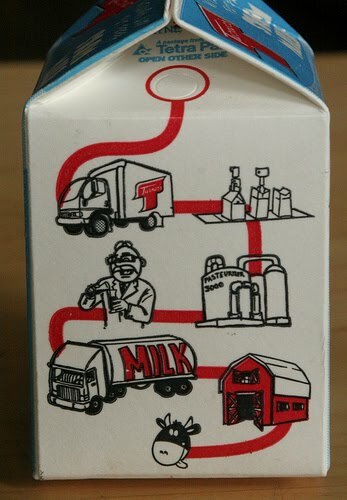 That's right: into the milk. Mothers provide their offspring with nutrients and toxins (pesticides, hormones, antibiotics, etc.) alike. But don't worry, pasteurization is an equalizing step designed to make a safe product even though the input might be quite less than. Or is it? With the advent of pasteurization, it doesn't matter if the cows are sick because the pooled product is (supposedly) sanitized, uniform, and ready to ship. Unfortunately, all the nutrient potential of real milk fresh from a healthy cow is lost in this process. Not only is the milk toxic from inhumane farming practices, but it is heated literally to death. The final product is less nutritious, not more. With pasteurization, outbreaks of disease are now distributed rapidly from large processing facilities and people forget that milk comes from cows, not from a store. Is Conventional Milk Even Safe for Calves? Although pasteurization reduces the microbial load of waste milk, pasteurization is not sterilization. A heavy bacterial load in waste milk will not be eliminated completely by pasteurization. Also, pasteurization does not remove potential contamination from antibiotics in waste milk. That really sounds like "an economical and nutritious source of liquid feed for young dairy calves" doesn't it? And don't forget that this warning applies to our OWN pasteurized milk, especially from non-organic sources. Quality matters! Unfortunately, despite the extended shelf life, pasteurized milk is already on the out. It's virgin soil to pathogens and without the protection of the beneficial bacteria that were killed right alongside any detrimental strands, pathogens are free to invade and have a field day. The heat also denatures the whey proteins, turning pasteurized milk its characteristic white hue. And the dead bacteria? Still in there. Yum! Pasteurization also cuts the nutrient content of the milk. Pasteurized milk has up to a 66 percent loss of vitamins A, D and E. 50% of the Vitamin C is lost. High heat affects water soluble vitamins and less effective. How much less? Anywhere for 35-80%. Vitamins B6 and B12 are completely destroyed during pasteurization. Pasteurization also kills numerous beneficial enzymes, antibodies and hormones. Pasteurization destroys lipase (an enzyme that breaks down fat), which impairs fat metabolism and the ability to properly absorb fat soluble vitamins A and D. This is why the milk is fortified with vitamin D. It is also why Americans in the 20th century experienced high cholesterol like never before. Milk is a wonderful source of calcium, but pasteurization makes calcium and other minerals harder to absorb. One method of testing to see if milk has been adequately pasteurized is to test to make sure that phosphates have been completely removed. Phosphates are essential for the absorption of calcium. Uh oh. Back in 2003, Dr. Mercola pulled together a sizable list of published studies finding fault with pasteurized milk. Compared to raw milk, pasteurized milk led to a loss of vitamins, increased incidence of tooth decay, less benefit to growth and development, less resistance to disease, and less calcium availability. How exactly is this beneficial? Raw milk from MAP-infected dairy herds. Ground beef originating from MAP-infected dairy cattle sold for slaughter. Domestic water originating from surface sources vulnerable to runoff from MAP-infected farms. Cuts of beef originating from MAP-infected beef cattle. Yes, unfortunately MAP can survive pasteurization. So how does this add to our discussion of pasteurization? Well, for one: pasteurization doesn't protect you against everything, and two: conventional dairy relies on pasteurization instead of proper care and feeding of its animals to produce quality milk, so it's cows are more likely to have MAP infection than those producers who believe that healthy cows produce healthy milk. How do you avoid your exposure to MAP? Know the source of your meat and dairy and make sure it is clean. This isn't so difficult if you buy grass-fed beef directly from a farmer (like Morris Grassfed in CA) who can answer questions about it's quality. Same goes for dairy. Good luck tracking down the purity of conventional milk, but if you find small suppliers, it's possible. For example, despite the raw milk warning, raw milk producers like Organic Pastures can attest to the quality of their milk and work hard to keep it clean and pathogen free because there is so much backlash against raw milk. Find more quality, local sources for meat and dairy at Eat Wild's extensive database. Homogenization squeezes the milk through a fine filter to break down fat and keep it from separating out like the cream that rises to the top of raw milk. Homogenization makes fat molecules smaller and smaller, which allows them to pass through the lining of your gut, transporting substances that shouldn't leave your digestive tract into your bloodstream superhighway. Not cool. One of those substances that shouldn't leave the digestive tract is an enzyme called xanthine oxidase, which plays a role in heart disease. It's carried by homogenized milk fat into the bloodstream. What other nasties sneak in this backdoor? How Does Pasteurized and Homogenized Milk Compare with Raw Milk? If you check out this colorful chart from Organic Pastures's website, you can plainly see the differences between raw milk and pasteurized, homogenized (to be concise, let's call it PH for pasteurized and homogenized) conventional and organic milk. With conventional PH milk, there are additives and preservatives, in addition to the hormones, antibiotics, and genetically-modified, pesticide-sprayed grain feeds (whew! that's a mouthful!). Even in organic PH milk the butterfat, vitamins, and protein need to be added back in and anything goes with the feed as long as it's organic (like the chart says, remember there are organic donuts, so "organic" does NOT mean healthy!). Organic grains are just as unhealthy for cows as non-organic. Cows evolved to eat grass. Period. The processing involved in producing PH milk leads to lactose intolerance among it's drinkers even in the organic milk because the enzyme to digest lactose has been destroyed through processing. Hence, more people are allergic to conventional and organic PH milk than raw milk. Finally, PH milk is NOT safer. According to the chart, 31% of the time human pathogens are still found in PH milk! Compare that to Organic Pastures's assertion that human pathogens "have never been found in RAW USA samples." So do you really want to drink a processed, nutrient-poor, watery, white liquid potentially filled with pathogens, and definitely filled with dead bacteria, denatured proteins, and altered fat molecules? Really sounds like it "does a body good" doesn't it? What other choice do you have if you want to drink milk? Go RAW! Check back for our next installment about raw milk. Hope this was an educational and eye-opening journey for you today! I know it definitely was for me!